I remember I said long ago that I do play the game. But I never really played it since I said that. Funny. I've decided it's cool to play around with those em spaces. For now. Because I decided that it's cool to play with it for now. But now I've done everything I wanted, so it's no longer now, but rather then. For now I've decided that it's enough for now and thus that now from earlier is not now any longer. The number's 68 twice now, for now. I think I broke the wiki today. And by that I mean pushed it to its limits. I've made one large table. I know it was large, because on the Recent Changes page it says I've added over 85,000 characters to that page. It was mostly because I copied and pasted yes/no cells as I was making it and each cell had background color and text alignment set. That's around 45 characters per cell used purely for aesthetics in 20x80 table. So once I saw that giant number, I tried to set these things differently to save characters, specifically setting text alignment for whole table and background colors for whole rows. As you can see by that second edit, it worked. But I'm interested in that "diff" button on the left of the Recent Changes page. It compares 2 versions of the page, in this situation version before and after certain edit. It doesn't have much trouble with showing what was added in that 85k edit, but it can't show what was changed in that 67k edit. When you click that "diff" button, it freezes the wiki for half a minute and then wiki spits out a blank page with few lines of text that look like the beginning of the comparison. My theory is that it has trouble showing that many small additions and removals with unchanged text in between. Today I tested with my friend that while you can't load other pages while wiki is comparing those 2 pages for you, you're not limiting anyone else from browsing the wiki. It looks like the 79th dot isn't grouped with others. I highlighted it and tried to count how many dots are before it only by moving my mouse cursor. It was surprisingly difficult, I've counted it right on my (I think) 5th attempt. All previous attempts ended on numbers that weren't even devisible by 3. Funny story: that was the only word from that post I checked in dictionary as I was writing it. The problem is that I was checking if it ends correctly, not if it also begins right. Ah, I see. It all makes perfect sense now. I rolled two 1s during DnD char creation - one was recommended to Warrior class (Constitution), the other one was vital to proper interactions with others (Intelligence). I rerolled Constitution, still got a little below optimum. The rest had good characters. Also, Steam login is becoming more unforgiving - you have to log in TWICE because of "No account could be found with that username" error and even then, it will take to forum preferences instead of returning to the page where you pressed the login button. Yeah, usually twice, occasionally thrice. Once I clicked that button at least 30 times and it still didn't log me in, so I filled a support ticket. They responded that they were able to reproduce the problem. This was roughly a month ago (maybe less, maybe more, my idea of time is terrible) but the problem is still here. With that said, I'd also like to mention that they were able to fix missing captcha test on the wiki within few days after I filled my request. They surely can do some things. But who knows what "some" means. Or which of those things they consider as important. I made this account just so I didn't have to deal with steam login, because for some reason I had to vertify my account every time I wanted to log in unless I logged in with the steam browser. An A press is an A press. You can't say it's only a half. Yes, you. Your meme is obsolete. The new meme is build up speed for like 5 hours. It could be build up speed for 6894 hours, though. No it's raising scuttlebugs for 13 hours, G E E Z L O U I S E G E T I T R I G H T.
I would like to know why people still meme about Pannen to this day though. 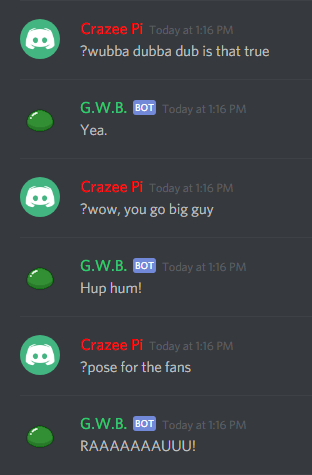 On a side note, I decided to try making a discord bot out of boredom and made one that tells you that you smell 6895 times. Feels as if it took about 6896 minutes to raise those scuttlebugs. I know, but why do they still often meme about him to this day? I'd figure everyone would grow out of it. I'm surprised that this meme I found few days ago is (or was) that much popular. And you also seem well informed about its creator's recent findings. I'm speechless. 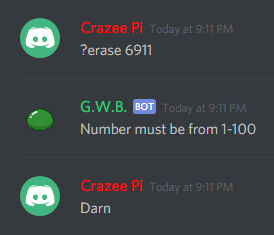 The number's 6900. The last insignificant milestone before 7000. Would me not making an anticlimactic milestone be anticlimactic in and of itself at this point? The meme's 2 years old at this point, so uh. I kinda wish the half a press meme wasn't a thing because whenever I see TJ in a comments section 6901 people appear and start memeing about that. Came back in hopes to edit something but nevermind. I've also seen Nathaniel Bandy mentioned a lot, especially with scuttlebugs. I don't know why he's such a popular name under Pannen's ABC videos, but I've seen him in some comment sections before. Idk whether or not he started it, but SimpleFlips is probably responsible for that. Tbh I hope SimpleFlips memes stay as Mario 64 community inside jokes because I'd really hate for them to go mainstream. Ohh, that's Rhythm Heaven! And watching people (or computers) spam in that particular minigame tends to be quite funny.